Huge pipelines run through this area. You can find an ammunition pile and a health cabinet near the building to the north-east, and a fuel pile is available at the checkpoint near the center of the area. An Assault Truck is parked at a small shelter in the northern part; you can also find a diamond briefcase here, hidden behind some fuel barrels. 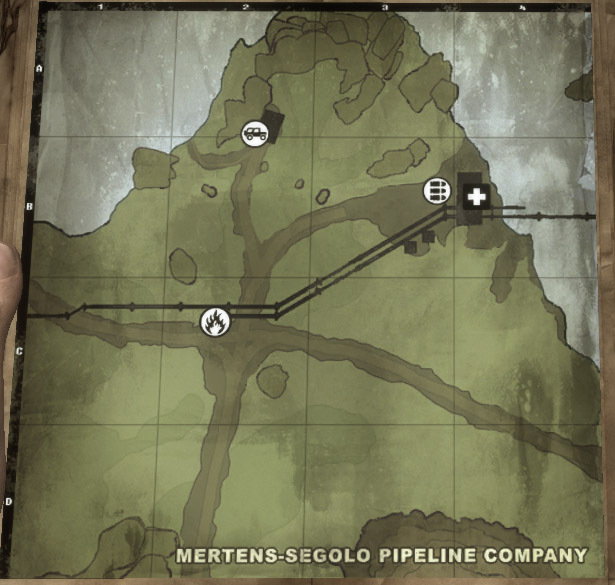 Please note that the default (unpatched) version of the game seems to have a bug - if you tag any equipment in this area before the fuel pile at the checkpoint, you won't be able to scout the checkpoint; so, be sure to tag the fuel pile at the checkpoint before anything else.